With cataract surgery, patient safety is our top priority. As our organization continues to learn and improve, we occasionally change the way we do things. This article addresses three adjustments we have made in our screening process to improve the safety and well-being of patients entrusted to our care. Unless identified ahead of time, several pre-existing health conditions may result in delayed or cancelled surgery. This is especially important for patients who schedule evaluation and surgery on the same day. Many patients we treat have hypertension. Most undergo cataract surgery without additional risk to their general health or visual outcome. However, when a patient’s blood pressure is critically high (200/100 or higher), we delay treatment. They are instructed to see their primary care provider to get it under control. We only proceed with surgery when the PCP clears the patient in writing for the procedure. Some primary care ODs check blood pressure at every patient encounter. To them it is as important and routine as checking visual acuity. Others check blood pressure only when it helps identify the cause of a specific problem—like a branch retinal vein occlusion. If you do not measure blood pressure, consider adding it to your cataract pre-op exam. Identifying uncontrolled hypertension and alerting the PCP may prevent cancelled surgery and a disappointed patient. But more importantly, it can identify a primary cause of stroke and heart attack. As cataract specialists, we do our best to accommodate even the most challenging cases in our ambulatory surgery centers. However, there are occasions when it is safer for patients to have cataract surgery in a facility that is better equipped for their care. At PCLI patients walk into the operating suite and seat themselves in a reclining surgery chair. In a hospital setting, they enter the OR lying on a gurney and are then transferred with assistance onto the operating table. Hospitals typically have motorized lifts that can also help safely transfer some patients. We are not equipped to lift patients onto or off of the operating chair. This limits us to patients who can walk or transfer from a wheelchair with little assistance. If your patient is wheelchair bound or walks unsteadily, ask whether they are able to transfer to a chair under their own power. If the answer is “No”, it is likely more appropriate for them to have surgery at a specially equipped surgery center or hospital. When patients are not sure if they can transfer on their own, we are happy to arrange for them to come to our facility in advance to check their ability. We can also usually accommodate patients who bring family or helpers who assist them in the transfer process. Several safety concerns prevent us from performing surgery on significantly overweight patients. Our operating room chairs are only designed to support up to 350 pounds. In addition, should an emergency arise, our staff would be at risk trying to support extremely heavy patients. Finally, managing emergencies and performing CPR is much more complex when patients are significantly overweight. For these reasons, patients above 350 pounds should have surgery in a hospital or facility that is specially equipped for their care. While 350 pounds is the maximum our equipment can handle, there may be health conditions that preclude our ability to safely treat patients who are under 350 pounds. We do not weigh patients. We rely instead on them indicating their weight on our history questionnaire. 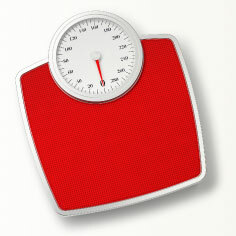 Consider asking your cataract surgery patients about their weight. Knowing they are less than 350 pounds before scheduling surgery can help prevent cancellations. You might consider noting these potential safety problems in your referral. At PCLI we review blood pressure, mobility and weight in our cataract pre-op evaluations. When a safety concern is discovered that results in a change of plans for surgery, we do our best to notify referring doctors as quickly as possible. By working together, we can avoid inconveniencing patients with delayed or cancelled treatment. 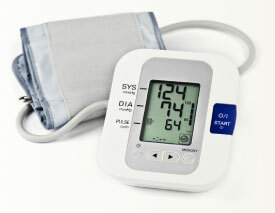 If your staff would like to learn proper blood pressure measurement techniques, we are happy to teach them. Just contact our nearest office. Is That a Gape in the Wound? Comanaging optometric physicians sometimes ask this question about the immediate post-op appearance of our cataract incision. The good news is that we rarely encounter wound leaks. We sometimes see an irregular or retracted conjunctival periotomy that overlays the incision, or an external gap between the incision’s outermost edges—but neither is a wound leak. The conjunctival periotomy overlying our surgeons’ mini scleral tunnel incision is made with scissors. It is neither self-sealing nor closed with sutures. The appearance of the conjunctiva is highly variable, particularly the day after surgery. Some amount of conjunctival gape is common but nothing to be concerned about. Like a conjunctival laceration from injury, the periotomy heals completely within a few weeks. 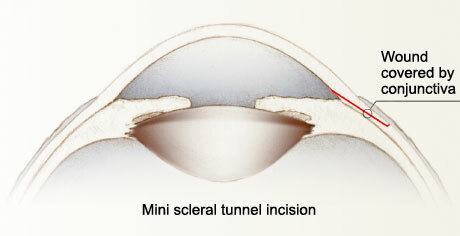 The mini scleral tunnel incision is constructed by directing a diamond blade at an angle instead of perpendicular to the scleral surface. The result is a reliably secure, self-sealing wound and leaks are very rare. In 23 years of practice, the few true wound leaks I have seen were never isolated findings. They usually involved low or no intraocular pressure with a positive Seidel test. With some cases, the pupil was peaked toward the wound, sometimes with a dark brown spot in the wound from iris prolapse. In addition, a wound leak may be accompanied by increased anterior chamber cells and flare. If you have any doubts, examine the wound with fluorescein. 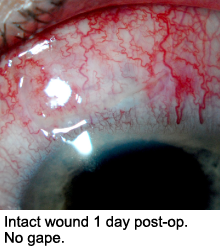 Unlike a wound leak, fluorescein will simply pool in any conjunctival depression where the periotomy is healing or at the edge of the external wound. There will be no movement or flow of fluorescein down onto the cornea as would be seen with aqueous leaking from a wound leak (Seidel test). A great way to sharpen your post-op skills is to spend a few hours with us in one of our clinics examining patients the day after surgery. Continuing education credit is available in our Washington, Oregon and Idaho facilities.